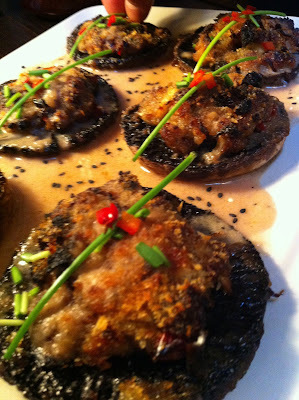 incredibly fed blog: Get Stuffing...! 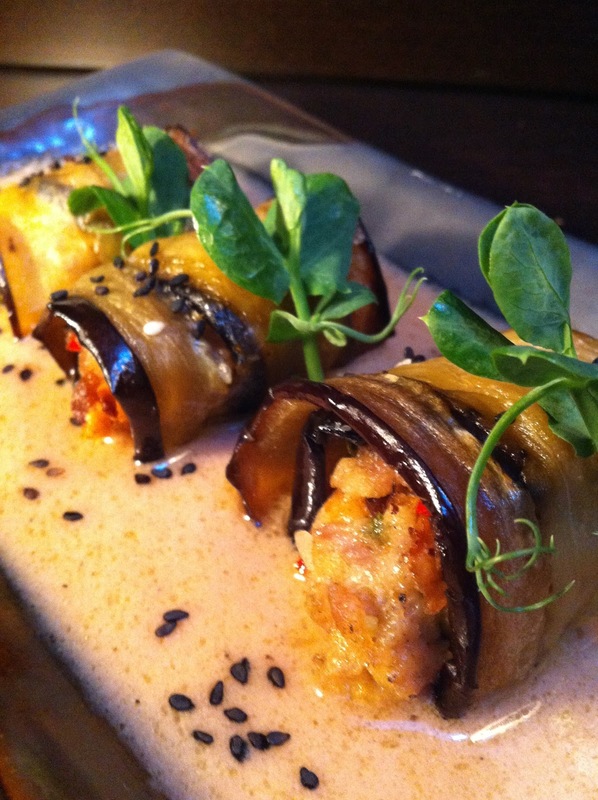 Aubergine rolls stuffed with sausage meat, breadcrumbs, herbs and spices. Technically speaking Lucinda was my first cousin once removed (my father's first cousin). In fact because of a significant age difference she fulfilled the role of my grandmother - having first brought up my dad, partly as a result of his own mother's overloaded matriarchal duties and partly because of her life long single status and consequent lack of any off spring. I remember her as an elegant white haired lady who was born in the Victorian era and who was a great cook. Throughout my childhood we often baked together and consequently it is to her I owe much of my love of all things culinary. Curiously Lucinda always hesitated to use the word "stuffing" preferring instead the term "concealment". A legacy I suppose from her own prudish Victorian childhood. "Stuffing" it seems always carried somewhat vulgar connotations! Today the term concealment would be met with glazed stares of incomprehension so for the purposes of this post let's proceed unencumbered by such linguistic niceties. So giggles aside what springs to mind when we speak of stuffing? Is it the annual ritual taxidermy performed on the Christmas turkey or goose or the pre - Sunday lunch surgical performance on the roast chicken, or joint of pork or lamb ? Despite its connotations we at IF happen to believe that stuffing is highly underrated ( if that's not an oxymoron!) Sausage meat is the obvious and perhaps the most convenient choice. Lamb, chicken, beef, pork or venison sausage meat all make a good stuffing base. Alternatively flaked fish such as salmon mixed with cooked rice is a great start or for a totally vegetarian option couscous with nuts and sultanas is delicious. Meats and fish can be used either cooked or uncooked. If using uncooked just blitz them in the blender using the pulse button and flavour with your choice of herbs or spices. Lighten the mix with a fistful of breadcrumbs. We keep a jar of crumbs on the go all the time - a great way to use those odds and ends of loaves, baguettes etc that always seem to get left uneaten. To the left we show large field mushrooms topped with a mix of sausage meat and bread crumbs while above we show equally delicious aubergine rolls - (which have in both cases been pre-cooked for a few minutes before the concealment was added and baked again for approximately 30 minutes).